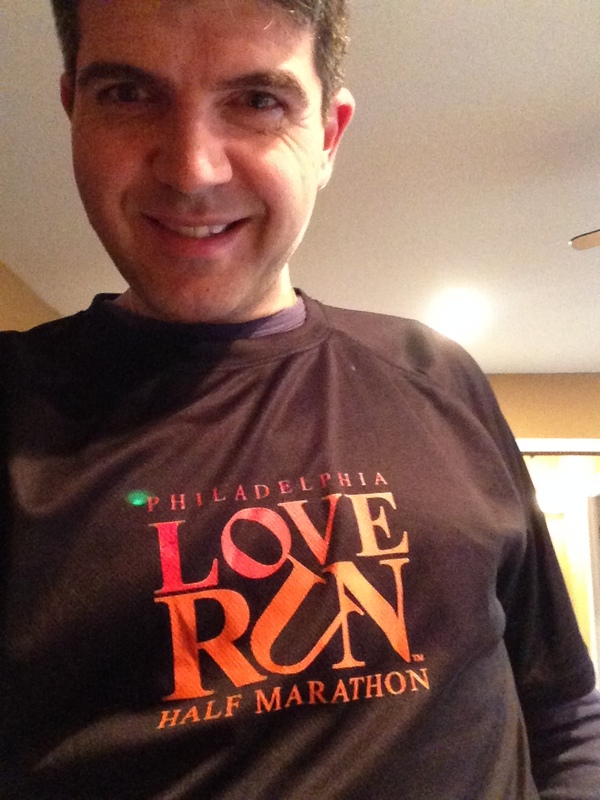 Yesterday I swam ran the inaugural LOVE RUN in Philadelphia. 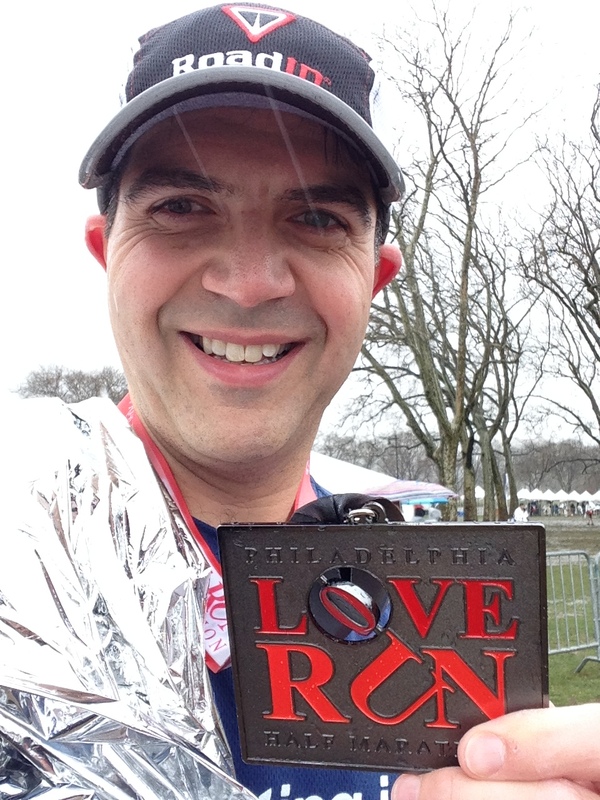 When planning my schedule for 2014 post the ‘Dopey Challenge‘ I hadn’t wanted to race too much as I was focusing on the New Jersey Marathon at the end of April but I was ‘encouraged’ to sign up. To explain briefly, with myself, my Wife and Sister-in-law all running Disney events early this year my future Brother-in-law (Mike) felt he needed to get in on the racing action and signed up for this race. 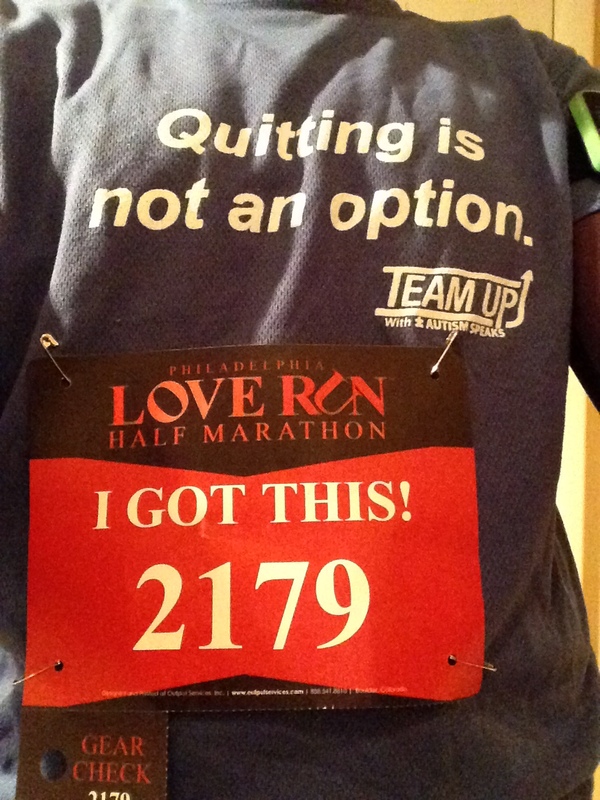 I was ‘encouraged’ to sign up so he didn’t have to run the race (or at least participate in the race) alone. My new role as race coordinator I guess. 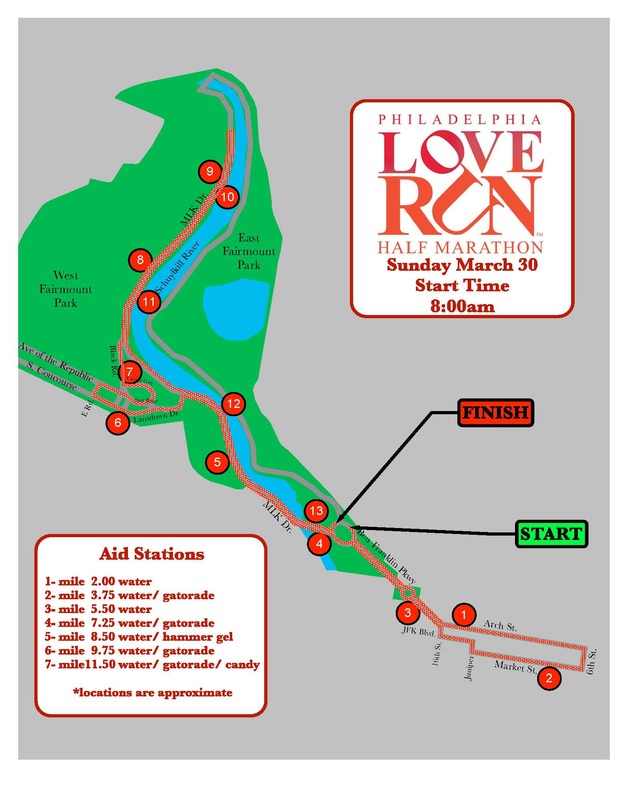 Anyway, this was the first LOVE RUN event so it was interesting to see how this race course and organization compared to other half marathons that are run here in the City of Brotherly Love. 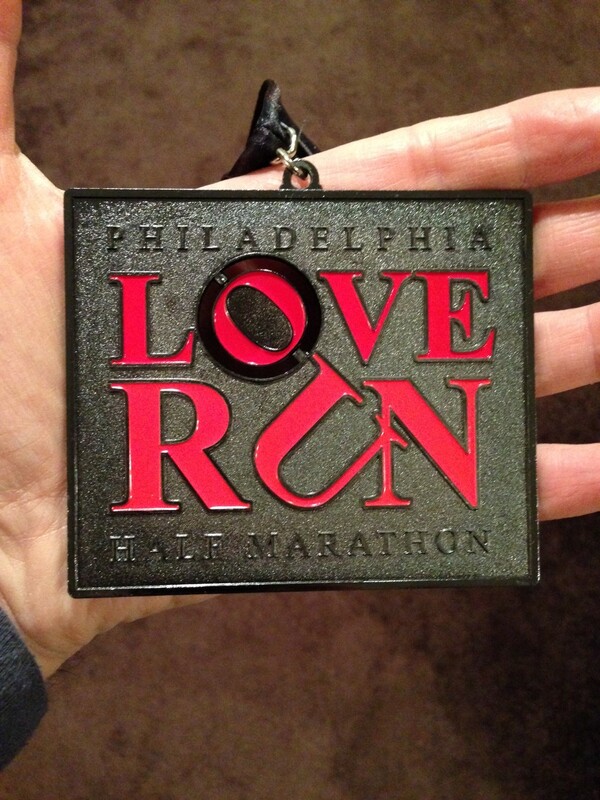 In the past I have run the Philadelphia Rock and Roll Half Marathon (in 2011, 2012 and 2013) and the Philadelphia Marathon (which also has a half marathon on the first part of the course in 2011, 2012 and 2013). 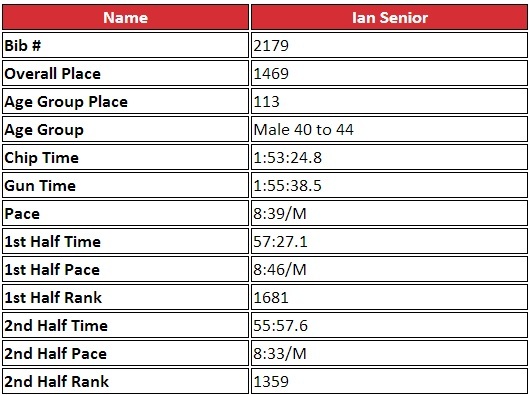 The course itself differed from these other two races which was a nice change (they didn’t release the course details until a couple of weeks before the race) so it would be enjoyable to run a different course. The race (like the others) started and finished along the Benjamin Franklin Parkway in front of the Philadelphia Museum of Art and took a brief circuit around the city before venturing up into Fairmount Park and past the Please Touch Museum (Memorial Hall) before an out and back along West River Drive (Martin Luther King Drive) to the steps the Art Museum. Only one real hill to deal with (although it was a big one) and pretty flat until you hit the last quarter-mile to the finish which is all uphill too. I was unable to attend the expo for this event so Mike picked up the bibs and race swag for me so I am unable to offer a review of that process. The race organizers (CGI Racing) offered vanity bibs on sign up so you could request a phrase or slogan instead of your name. I honestly don’t remember requesting this slogan but I was okay with it. In addition to the race shirt (a little black number 🙂 ) we received a mug with the race logo. Nice. As we approached race weekend the weather forecast wasn’t looking too promising. Indeed, our plans for that weekend (a pre-season Phillies game) were called off due to the weather. I had mixed feelings about what to wear for the race based upon the conditions predicted. I ended up choosing a short-sleeved t-shirt with arm sleeves in case it warmed up. I also packed a changed of clothes should I need to change (Ha! Should I?…more on that later). Mike arrived early Sunday with my bib and we headed down to Philadelphia together. I decided to park in an indoor lot to stay warm as we were a little early. This was a good choice for us later. Early morning arrival. Mike and I stay warm in the car until its time to go to the start line. At the bag check area. Already looking a little muddy behind us. The race announcer said there were around 10,000 runners in attendance and encouraged us to get to our corrals early. The corrals were not assigned numbers or letters but the bibs corresponded to predicted time so lower numbers were closer to the front and higher numbers to the rear. Mike and I headed to the corrals together which was quite an obstacle course. 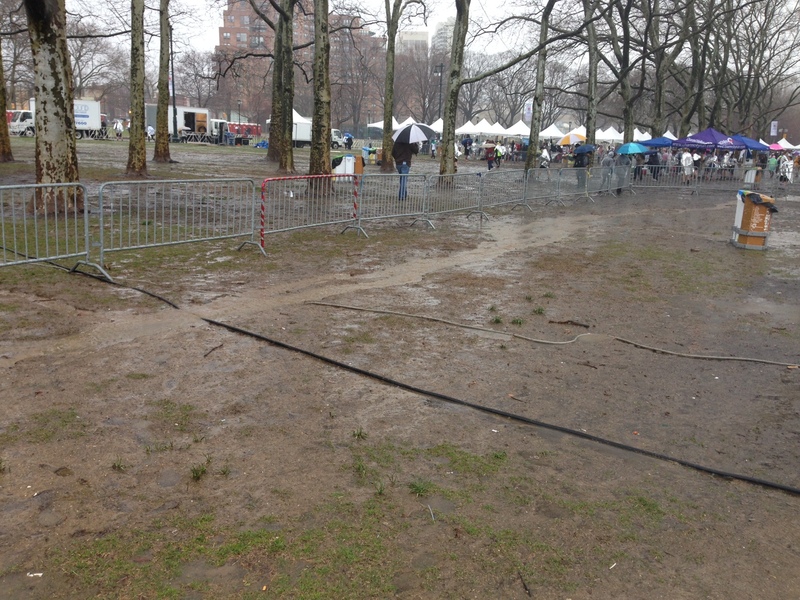 As the ground was wet most people stuck to the pathways which meant that we couldn’t just cross Eakins Oval to the corrals but had to maneuver around fencing put up by the organizers. At one point this involved climbing into the (dry) fountain and around a gate. A bit of a challenge when it was wet and slippy. Don’t get me wrong…I’m not blaming the organizers for the weather it’s just that I’ve never had to think about getting to a corral this much before. This couldn’t be helped but perhaps they might in future want to on the day look at the positioning of some of the barriers to see if they could be opened up a little more (without messing up any security in place). As you can see from my start line photo it was very misty. You could not see the tops of the skyscrapers in the city. 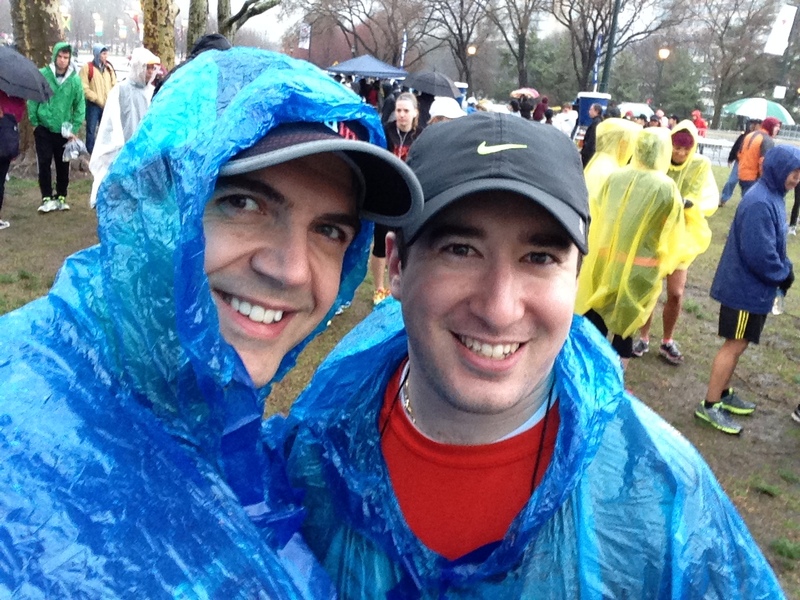 The rain also started to pick up a little once we got situated in the corrals (around 7:45am for an 8:00am start). Not my usual pre-race attire. As the race started the rain started to pick up. Within a half mile I could feel the rain kicking up behind me and my compression socks were already beginning to get damp. I had thrown off my poncho before we crossed the start line but some other runners were less considerate. 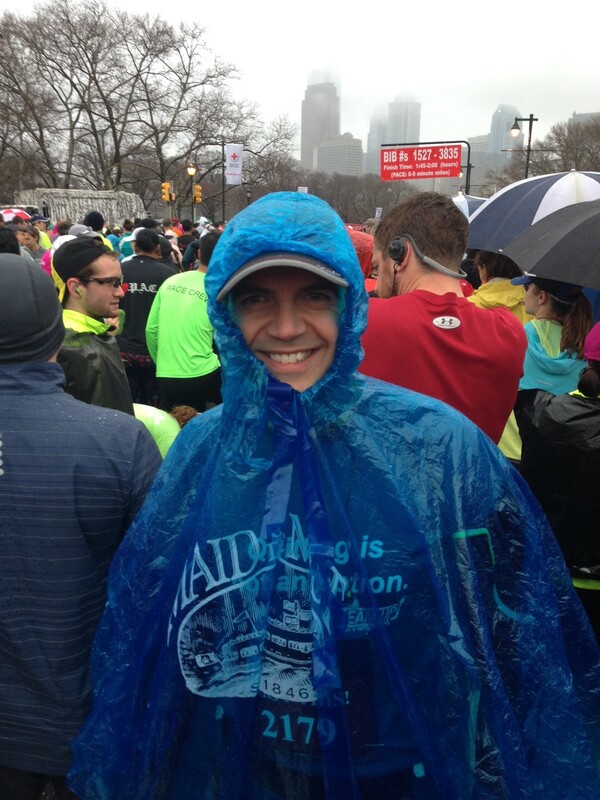 Although I saw people the whole way through running with ponchos, the first mile or so had me dodging, leaping and hopping over discarded ponchos in the middle of the course where within the first mile it is always crowded. It was already wet and slippy without these added hazards. I hope no one slipped and fell and I hope that my fellow runners in future would be aware of this and at least discard trash bag ponchos at the side of the course. Okay…off my soapbox. 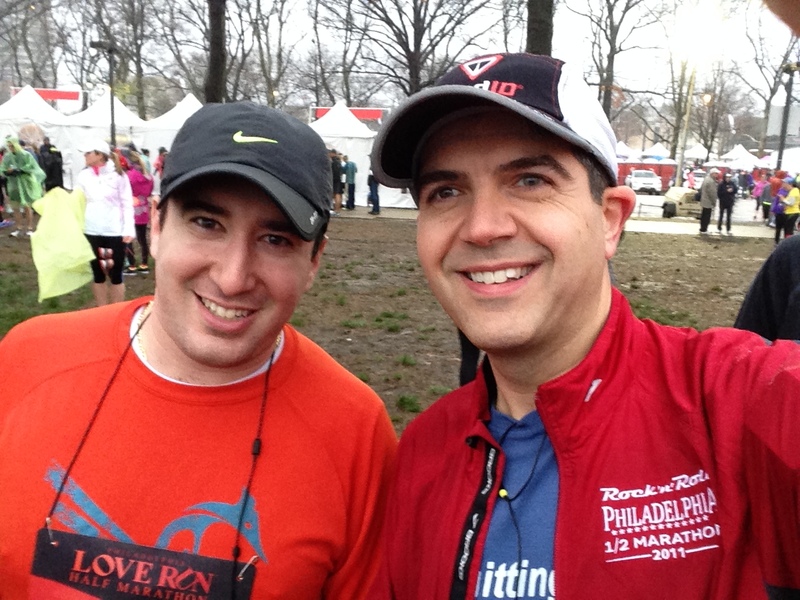 With the rain and wind picking up we threaded our way through the streets of Philadelphia towards and past Independence Hall and then turned back towards the Parkway at around mile 3. There were no water stations on the first few miles of the course (not that I saw any if there were). According to the course map I had run past two water stations but if I missed them I didn’t see any tell-tale signs of water stations (discarded cups by the side of the street). By mile 3.5 we were back on the Parkway running up towards the Art Museum. I could already feel my shoes were wet inside due to the conditions. Oh well, only 10 miles to go. As we rounded the Art Museum to the left around mile 4 I moved over to the left (as I tend to stick to one side for my run/walk Galloway intervals) and completely missed the first water station. Ugh. 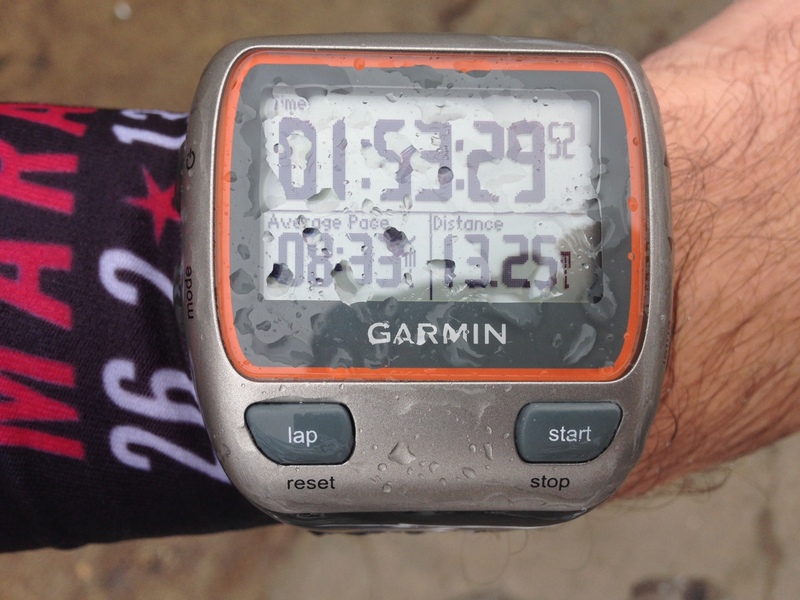 I was moving at a decent pace and I actually was wishing for a water stop. I didn’t want to cross in front of anyone so I just ran on down the underpass towards the entrance to Fairmount Park. Keeping to the side for my run/walk intervals was a challenge as this was where the water was draining off to. 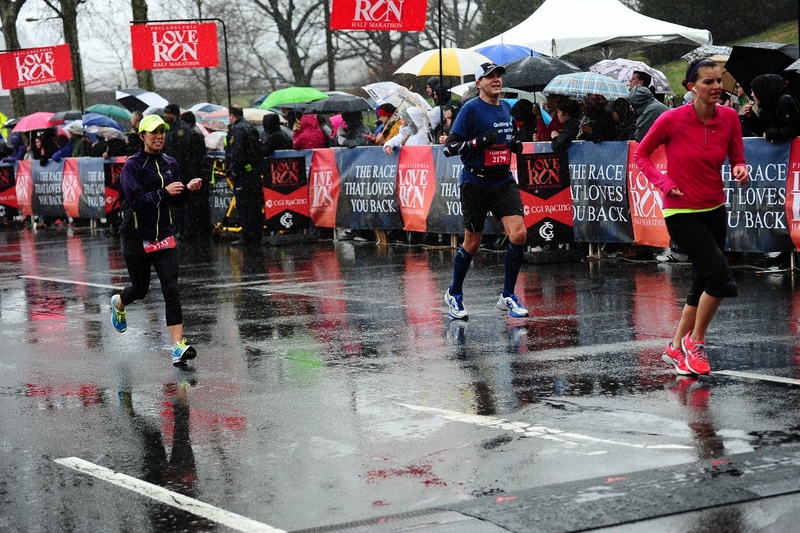 I tried my best to avoid the puddles but this was harder and harder as the rain became more intense during the race. 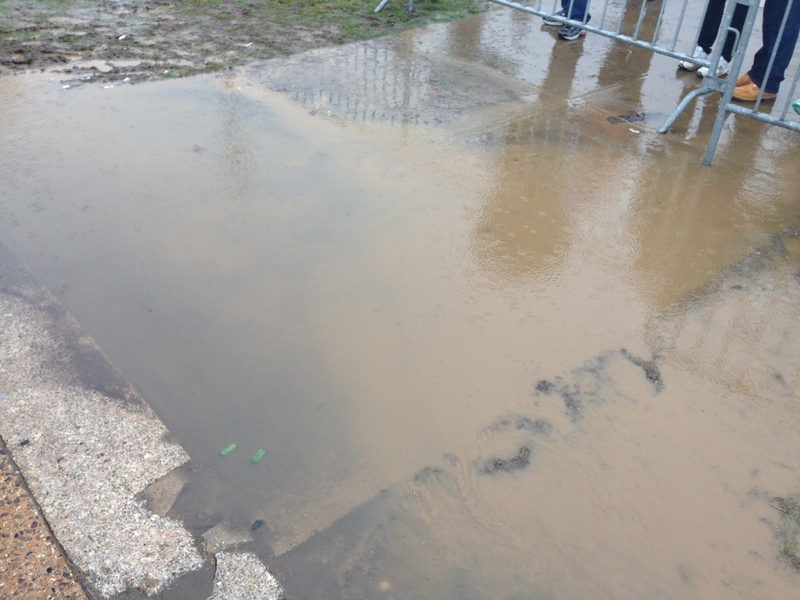 In fact the water started to encroach on the width of the course for all runners in some low-lying points of the course. Rounding in front of Memorial Hall took us on a minor out and back towards the downhill leading to the real out and back on West River Drive. As I approached the water station at mile 7 it was congested and so I ran to the furthest table only to find I had grabbed orange Gatorade! Yuck!!!! I’m not sure if it is just me but in every other race I seem to have run it is electrolytes first and then water second. All the cups were the same nondescript design so it wasn’t obvious what was in them. Oh well, I guess it was better than no fluids at all. What goes up must come down. After the big incline leading up to the park we then got to run down the decline down to the out and back along the river. The out and back was from just after mile 7 to just after mile 9 which then turned us back home to the finish line area. 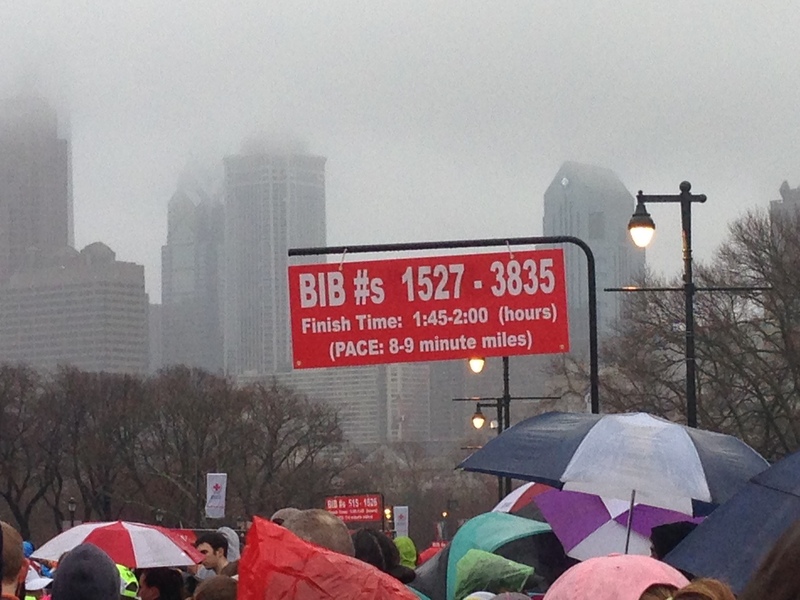 By the time I got to mile 9 I was just totally soaked through. The rain seemed to get heavier (even sideways at some points) as we progressed through the morning. I was wearing gloves to keep my hands warm but by this stage they were just like sponges and I was making fists to squeeze the water out. It was also getting colder and from about my waist to my knees I was getting a little numb. Oh the joy! I made it to mile 13 and I rounded the corner to the finish line. Crossing the timing mat near the finish I heard my name being called by the announcer and with a grin from ear to ear I ran across the finish line and quickly glanced down at my watch. I missed my PR by 41 seconds (Atlantic City Half Marathon 2013) but considering the conditions I was very pleased with my run. A negative split indicates that I did run sensibly for the half marathon and I feel good going into the marathon next month. 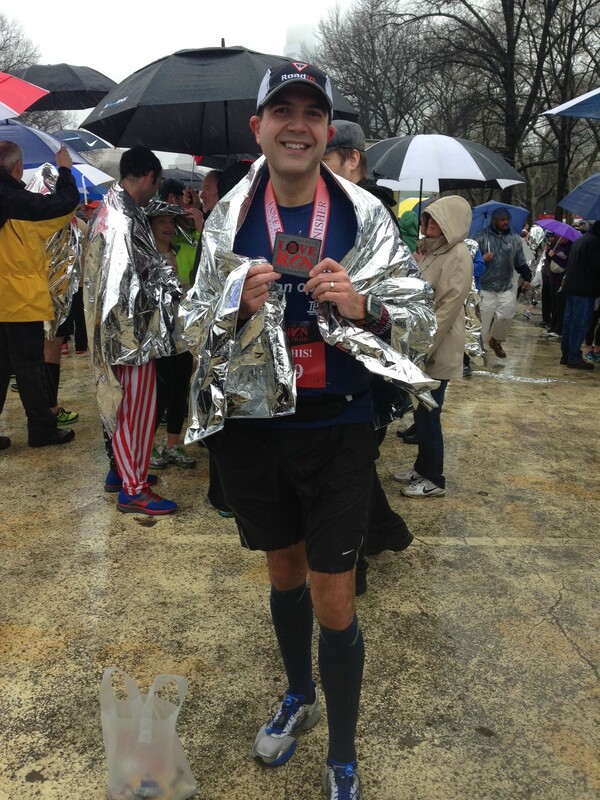 I made it through the finish line area where thankfully they were handing out mylar blankets to all the finishers. I did not stay in the area to see whether they had enough for the later finishers but it was very welcome. A nice plus for this race is that everyone gets a free finish line photograph courtesy of the race and Chessie Photos. From the finish line we went through a tented area to grab our post race food. Everyone was provided with a plastic bag with local Philly favorites (a soft pretzel, a Tastykake, a bag of chips, a Smucker’s Crustable PB&J and a banana) and beyond that there was an area serving hot chocolate. 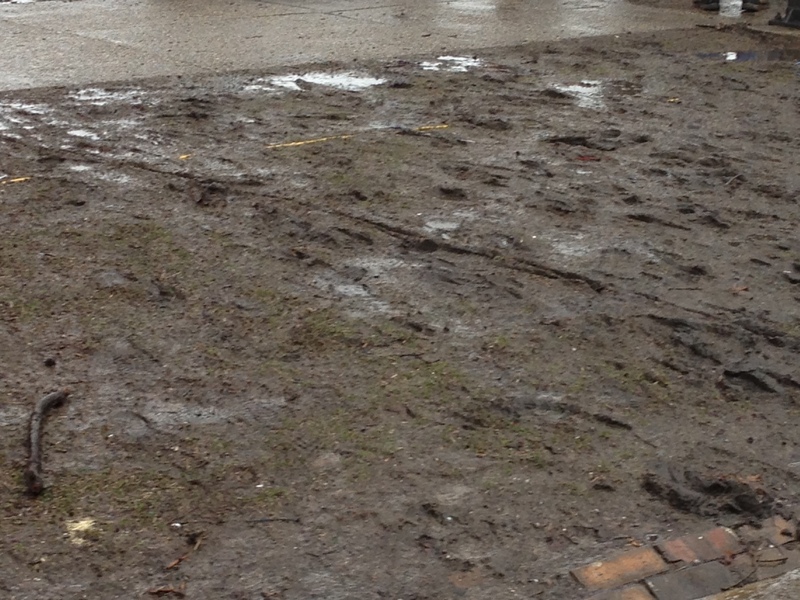 The ground was pretty saturated by this point and getting across to the hot chocolate station involved traversing what looked like a rainy outdoor concert area. The hot chocolate was nice and warm though. 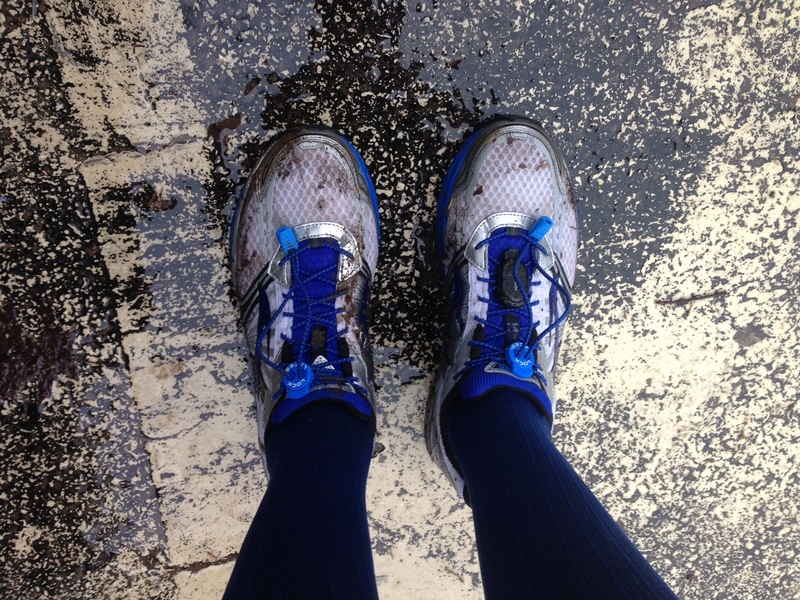 I am so grateful my wife had talked me out of wearing my new shoes for this race. I am trying to break in a new pair before the marathon and had only run twice in them so far. These shoes were absolutely saturated and a little muddy (I trod carefully) and luckily after some TLC they are wearable again. Finally got my gear bag. Water is still dripping from my face. Soaked, shivering but happy. I waited around for Mike to finish. Unfortunately there were no places to take shelter so by the time we finally met up I was so cold I was visibly shaking. We had a hard time reaching each other at the finish line as our phones and fingers were so wet our iPhones became practically inoperable. I couldn’t answer calls because my fingers swipes had no effect on the phone. Hmm…technology is fabulous until it stops working on you. 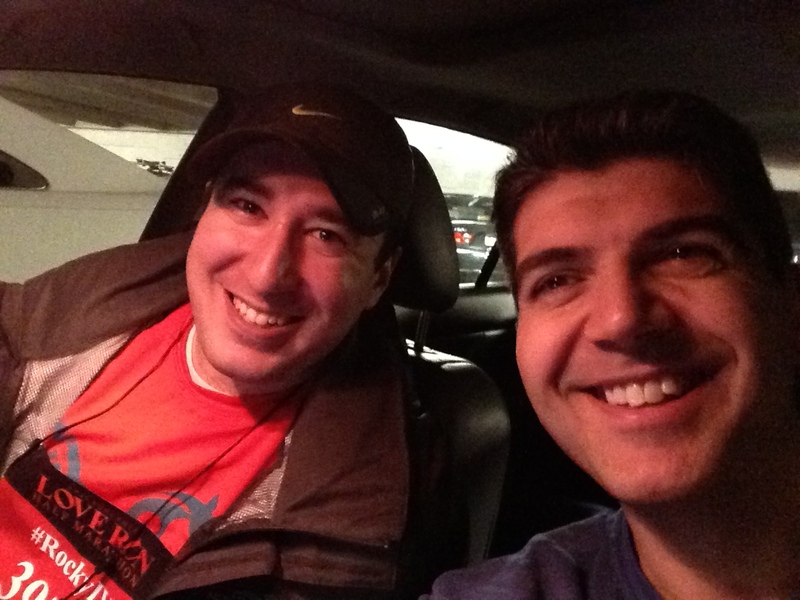 With Mike and I finally reunited we headed for my car which I had fortunately parked in an indoor garage. I was unable to put my parking ticket in the machine as that was also soaked (ugh) and thankfully the cashier did not check my signature on the debit card slip I signed as I was shivering so much it looked like hieroglyphics and not my handwriting at all. Finally making it to the car we (very modestly) stripped down to put on dry clothes. I unfortunately still had to wear my soaked shoes and socks until I got home but my heated seats never felt so good. After a (very long) hot shower I had feeling back in all my extremities and had the chance to relax a little. I got a chance to put on my race shirt and admire my new medal. It was a nice first event. Nothing at all could be done about the weather so it was unfortunate from that respect. 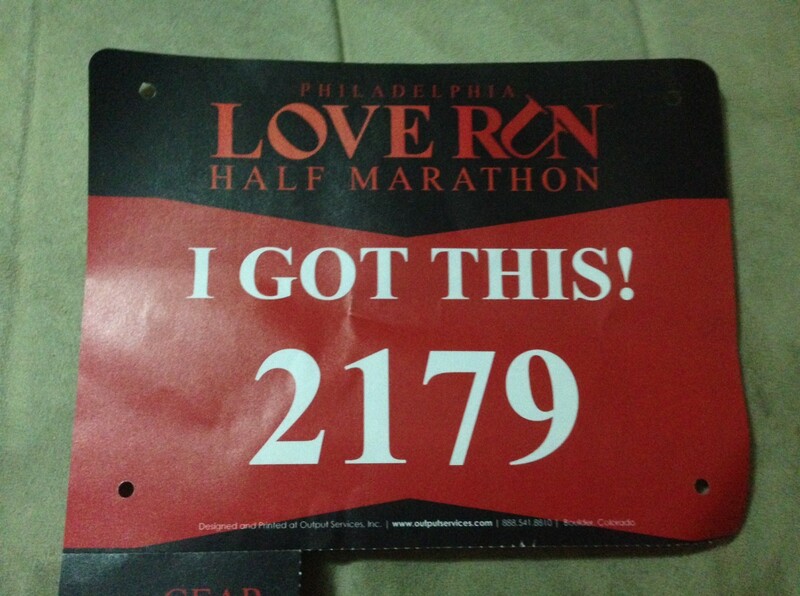 I did enjoy the course as it was different from others I have run in Philly. I think an improvement next year would definitely be in the areas of the water stations and perhaps maybe some shelter provided at the staging areas in case the weather is similar. CGI should be commended on this as an inaugural effort. Volunteers were plenty on the course and they were great to be standing out there in the rain for all those hours. You always have to thank the volunteers but this goes beyond your typical thanks. Well done. I will return I hope next year (with my wife running alongside me too) and hope for some more agreeable springlike weather for 2015. Congrats! Sounds like a great race- I like all of those after-race Philly snacks 🙂 And that medal is pretty awesome. Great recap- congrats again! Great job in not so great conditions! 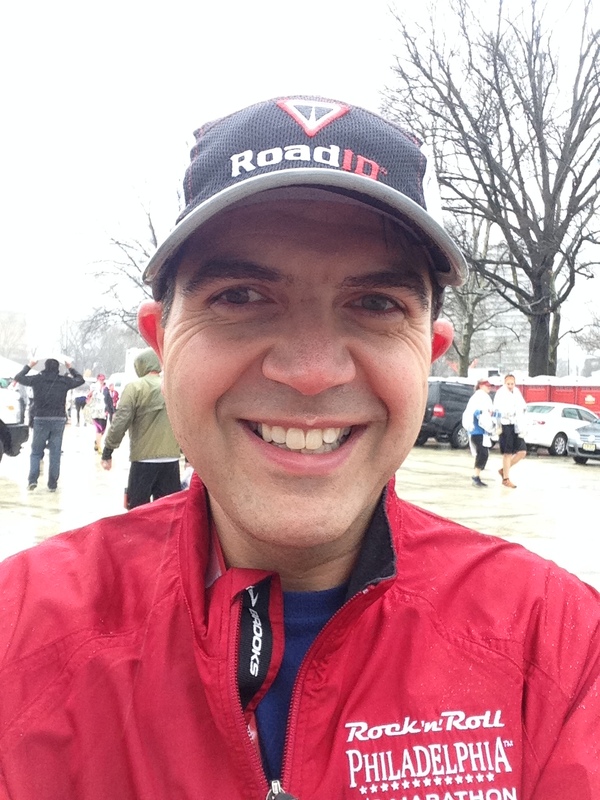 41 seconds off from a PR in those rainy conditions? Wow! I LOVE the medal! Great recap, thanks for sharing! I agree, CGI did a great job on this inaugural event, and I was a fan of the course, better than the Philly RNR in my opinion. =) Great time too, congrats on the near PR, I was less than 20sec from a PR too (unexpectedly as I was using this run as training for the NJM too).